At #93, Octopus and gout is today’s topic out of the top 100 gout searches, in the Gout and You series. Octopus is one of many mollusks listed in the Finfish and Shellfish Products group of the USDA nutrition database. It is not in the list of Key Foods, but I have added it to my Gout Foods Table for Fish. It is nutritionally different from the clams and oysters that are listed in key foods. In recipes, it can be interchanged with squid (calamari). However, squid is also missing from the Key Foods list, and so I have added octopus to the table, and I may add other fish later as they occur in the top 100 topics. You will see I have included both raw and cooked values. I know that raw octopus is used in sushi and other Eastern cuisines. However, most of us are more familiar with cooked octopus. Indeed, it plays a strong part in the Mediterranean diet, which is very gout-friendly. There are no gout-specific properties of any significance for octopus. However, a good gout diet should include some fish, and it is a better protein source than red meat. Octopus is particularly good for vitamin C, which is lacking in most fish. Unfortunately, it is also relatively high in iron. This is OK, as long as the rest of your diet includes enough low-iron foods to achieve a healthy balance. 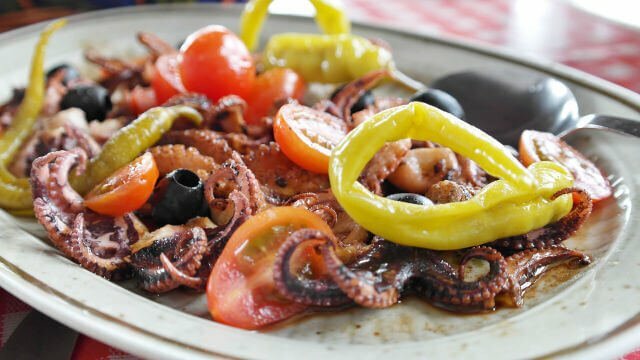 Octopus In Your Alkalizing Gout Diet Menu. Like all fish, octopus is acid-forming. But it is important to include some positive PRAL values in your diet to provide a wide range of healthy nutrients. See why a variety of acid and alkaline foods is important, and how to balance them in the Alkalizing Gout Diet Menu Guidelines. Overall, this study showed that rinsing foods in water effectively reduces total purine content and subsequent cooking after rinsing results in an even greater reduction of total purine content. 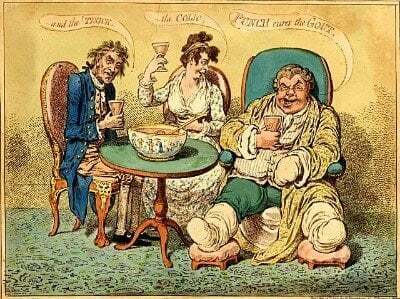 This raises all kinds of questions about the best way to prepare food for gout sufferers. I will investigate this further, and update my guidelines where appropriate. Octopus, like squid, is a nutritionally ideal source of protein, containing all of the essential amino acids in perfect proportions. It is an excellent source of B vitamins and minerals. […] Since octopus contains very little saturated fat, it may be considered a heart-healthy source of protein. […] Eating a balanced diet low in saturated fats is the best way to maintain heart health. Do you have some great octopus recipes? Then I hope you can help fellow sufferers choose better gout foods. So, please share your gout-friendly fish recipes. But don’t worry if you are not sure if your fish recipe is good for uric acid. Because I will check it and adapt it for gout sufferers, if necessary. Tomorrow, #92 continues top 100 gout searches countdown with another gout foods topic. Please subscribe to my free gout update service to make sure you don’t miss it. Leave Octopus and Gout to browse the Gout Foods guidelines.